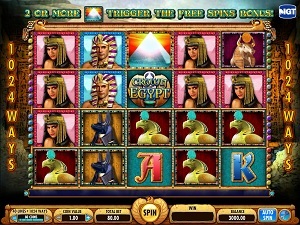 Crown of Egypt is an online video slot machine game released in December 2012. It is offered exclusively at online casinos powered by IGT (International Game Technology). This video slot game has 5 reels and 40 pay lines. The theme of Crown of Egypt is, of course, about Ancient Egypt. If you have been a long-time online slot player, you will surely see that there are a lot of slots games that feature Ancient Egypt as their theme. Most online slots players, if they find out that a particular slot game has just been released and its theme is inspired by ancient Egypt, they would say, “Oh no, not another Egyptian slots game!” If you think like this too, why not take a look for yourself, and for sure you will definitely change your mind that Crown of Egypt is “not just another Egyptian slot game”. Most players who have never had played this before are very happy they did, because it’s very generous in many ways, mainly thanks to its 1024 ways to win feature! Online slots games are very fun and exciting to play at once you have got a taste of its free play mode, and that is what’s great about IGT because they let interested players to play instantly on any of their online slot games, without requiring them to download. Every person who plays land-based casino slot games will surely know about the Crown of Egypt slot game, because it features Stacked wild symbols, Stacked scatter symbols, a Free Spin Bonus Feature game that can be re-triggered again and again until you get a max of 130 Free Spins, a Top Prize of $/£/€ 250,000 for a single bet, a MultiWay Xtra™ Feature which lets you have 1024 ways to win per spin, and last but not least, it has a 95.03% theoretical average RTP (return to player)! IGT brings to the online world slots games that could only be found before at land-based casinos, and Crown of Egypt is surely going to be one of your favorite online slots games to play at because it features not only the richness of Ancient Egypt, but also its richness in rewards, slots-style! The background setting of Crown of Egypt is basically the arid desert where the ancient civilization of Egypt once proudly stood. The symbols used in the game look like the real thing – Cleopatra, the pharaoh and various statues of Egyptian deities such as Anubis, Ra and Hathor. You will most certainly love its animated programming whenever you get winning combinations. The graphics are much richer when you get into the Free Spin bonus game and extra symbols used there include the statues of Bast, Thot, and Sobek. The overall graphic design of Crown of Egypt showcases a wide variety of vibrant colors including red, orange, yellow, purple, pink, gray, blue, green, and of course, brown and gold. Constant, solemn Egyptian-themed background music with a snake’s rattle will be heard when you first open the game; but, when you spin the reels, lively Egyptian-themed music will be played out. The vibrantly-colored card deck symbols and Egyptian symbols included in the Crown of Egypt online video slot game are greatly matched by different kinds of entertaining Egyptian-inspired sound effects whenever you get a winning combination. Once you trigger the Free Spin Bonus Feature game, you will be taken to a hidden chamber where you will play your free spins, and fast-paced Egyptian-themed background music will be played, which makes the player feel more anticipation as the Free Spins automatically play out and help them win some cool prizes! The card deck symbols used in Crown of Egypt slot game are J, Q, K, and Ace. The other symbols that you will see in the Crown of Egypt online video slot game are Egyptian deities such as Anubis, Ra, and Hathor; and famous Egyptian persona such as Cleopatra and the Pharaoh. The Wild Symbol is the Crown of Egypt symbol. The Crown of Egypt wild symbol acts as a substitute for all other symbols (with the exception of the scatter symbol) in order for you to complete winning combinations. The Crown of Egypt wild symbol can only be found on the 2nd, 3rd, 4th and 5th columns, and can come out stacked. It is possible for up to 4 Crown of Egypt wild symbols to appear on a reel at the same time per spin, which makes this a Crown of Egypt wild symbols Stack. Crown of Egypt Stacked wild symbols significantly increase your chances of winning big prizes by substituting for other symbols to help you complete winning combinations. The Scatter Symbol is the Pyramid. The Scatter symbol (Pyramid) does not need to come out in a line on an enabled pay line for you to win. The Pyramid scatter symbol can be found only on the 3rd column and can also appear stacked. It is possible for up to 4 Pyramid scatter symbols (found anywhere on the 3rd column) to be obtained, which makes this a Pyramid scatter symbols Stack. If you manage to get 2 or more Pyramid scatter symbols (on column 3), you will activate the Free Spin Bonus Feature game. Please take note that the Pyramid scatter symbols do not give out any winnings; however, they allow you to enter and play the Free Spin Bonus Feature game. Crown of Egypt Free Spin Bonus Feature Game – If you manage to hit 2 or more Pyramid scatter symbols (that can be found anywhere on the 3rd column), you will activate the Crown of Egypt Free Spin Bonus Feature game. The Free Spin Bonus Feature game has more vibrant reels and even more ways to win as compared to the regular Crown of Egypt online slot game. When you get 2, 3, or 4 Pyramid scatter symbols on the 3rd column, the Free Spin Bonus Feature game will be activated wherein you will be given 10, 15, or 20 Free Spins respectively. While playing the Free Spin Bonus Feature game, you can actually re-trigger the Free Spin Bonus Feature many times. The Free Spin Bonus Feature game will continue to be played until the Free Spins are all used up, or until the maximum number of 130 Free Spins have been used up, or until the Top Prize of 250,000 credits is obtained. Please take note that the maximum win on any transaction is limited at 250,000, regardless of the size of the bet. A transaction involves the results of the Free Spin Bonus Feature game plus the outcome which activated the bonus. If the maximum win is obtained in the Free Spin Bonus Feature game, the Free Spin game will end instantly, even if there are still Free Spins that remain. Keep in mind that all of the bets and pay lines played in the Free Spins, including the 1024 ways, are exactly the same as on the reel spin that triggered the Crown of Egypt Free Spin Bonus Feature game. If you would like to re-trigger the Free Spin Bonus Feature game, you must get 2 or more Pyramid scatter symbols (on the central column) during the Free Spin games. Should you manage to do so, you are awarded another set of 10, 15, or 20 Free Spins! The additional Free Spins will be included to your remaining number of Free Spins. You can win up to 130 Free Spins while playing the Free Spin Bonus Feature game. When the Crown of Egypt Free Spin Bonus Feature game is over, you will be taken back to the main Crown of Egypt online video slot game, and your winnings acquired from the Free Spin games are included to your overall balance. In Crown of Egypt, players get to enjoy its unique MultiWay Xtra™ Feature wherein there are 1024 ways to win on every spin! MultiWay Xtra™ symbol awards pay for matching symbols in any position in adjacent columns, starting from the leftmost column. More than one matching symbol in the same column multiplies the award. The Crown of Egypt wild symbol substitutes for all other symbols (except for the Pyramid scatter symbols). • Count all the Falcon and Wild symbols in each column. • Calculate the award amount in currency by multiplying the award (40 coins) by the coin value. For instance, if the coin value is £0.02 then the award is £0.80 (40 x £0.02). • The total pay is the award value (x) the total number of winning ways (£0.80 x 4 = £3.20). The win message displayed will be: MULTIWAY XTRA™ WIN PAYS: £0.80 X 4. Crown of Egypt has 5 columns, 20 reels where you may bet on 1 to 40 paylines, or you can choose to play 40 bet lines with 1024 bet ways to win on every spin! The minimum bet is 0.01 and the maximum bet is 5.00. You can wager 1 coin per payline, but in the 1024 ways, each pay line costs 40 coins. Please take note that for every coin that you wager, you will enable another pay line. You will be paid out for winning combinations on enabled pay lines only. It is absolutely more fun and easy when there is an Auto Spin function available in online slot games. In Crown of Egypt, you can access their Auto Spin function by clicking on the (blue) Auto Spin button on the lower right corner of the screen (next to the Paytable). You are given the choice of how many spins you would like the game to do automatically for you – from as low as 10 up to as high as 50. When you choose a number, say 40, the Auto Spin function will keep track of the remaining number of automatic spins. The Auto Spin will stop only when a Bonus is triggered or the balance is insufficient to spin again. Also, you are actually given the option to stop the Auto Spin yourself, just in case you want to.